Home Local news Lagos Police Commissioner 'Paraded Innocent Man' As Cultist? Lagos Police Commissioner 'Paraded Innocent Man' As Cultist? 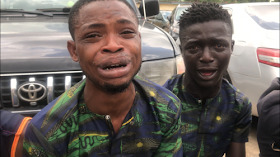 Bayo Jimoh, a 26-year-old transport worker, and about 35, others were paraded before the media for different criminal offences ranging from cultism, kidnapping, ritual killing and s*xual assault to abuse. The CP told pressmen at the suspect parade that Jimoh and 30 others were members of the ‘Eye’ cult group arrested in different parts of the state.